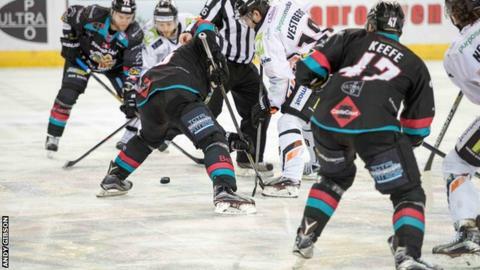 The Belfast Giants' Elite League hopes suffered a blow as they lost 6-2 to the Sheffield Steelers in the first of back-to-back games between the sides. The defeat keeps the Giants three points behind leaders Cardiff while Sheffield leapfrog Belfast into second in the table - two points off the pace. Sheffield's first-period blitz set up their win as two Tyler Mosienko goals helped them into a 4-0 advantage. Craig Peacock and Chris Higgins replied but the damage had been done. Mathieu Roy also scored two Sheffield goals with Fredrik Vestberg and Ben O'Connor adding the visitors' other goals. Peacock's second-period goal came with Belfast 5-0 down and while Higgins netted midway through the final period, O'Connor's goal completed the scoring. The Giants will have an immediate opportunity to avenge Friday's result in Saturday's game at the SSE Arena. Going into Saturday's round of fixtures, the Giants have two game in hand on leaders Cardiff and have also played one match less than Sheffield.